This was a, 'what's all the fuss about?' read. And there's sure been a lot of fuss about this book. Cheerleaders gonna cheer and haters gonna hate. Not being especially biased either way, I wanted to give the book a decent hearing. You'll have to judge for yourselves whether or not this is in fact a fair minded review. Also, the 'hymn' bit in the title appealed to me. Most of the books I read are in the fields of theology and biblical studies, or have something to do with me being a Baptist Minister. Knowing a good hymn when I see it is part of the job. I'm also chair of governors of a LA maintained secondary school, hence my interest in the world of education. First up, the things that got my goat. Michella exceptionalism. You know, the 'we're the only school that does this, that and the other' bit. Even as you're thinking, 'Eh? We also do this, that and the other in our school.' Things like every day is an open day, the promotion of an ethos of hard work and kindness among students, and so on. No doubt, like all schools, Michella has its distinguishing features, but sometimes it felt a bit like me as a Baptist preacher leaning over my pulpit one Sunday morning and grandly telling my flock, 'Look, we're the only true Baptist Church in Britain, holding to the doctrine of the Trinity, baptising believers, and such.' I can imagine our longsuffering people responding, 'No we're not, silly, how about all the other ones?' Well, yes. Michaela's exceptionalist tone is alienating, where instead the school could have positioned itself as a unifying force for the new educational traditionalists on the block. Whether they find themselves in free schools, academies, MATs, or bog standard LA comps. Plus, a bit premature, isn't it? I mean, writing a book on how amazing your secondary school is, when you've only got a Key Stage 3. All progress measures must be based on internal assessment. No GCSE or A Level results to benchmark how you are doing against the national picture. How's your Attainment 8/Progress 8 figures/Post 16 performance measures? That's the proof of the pudding. I hope that Michaela lives up to its promise and results are up there with the top 10% of schools year in year out, but that remains to be seen. Not having a Key stage 4 also means you haven't got Year 10 & 11s coming into that 'difficult age'. That's where things can start to get complicated. More to behaviour management then than getting kids to pick up a grape without throwing a strop. May have been better to have waited until there was some hard evidence to back up the claims made here. Then there's the martyr complex, 'everybody hates us' thing. Look, it's not just new-fangled free schools that get dissed. Try turning around a forever RI comp and you'll have grief. Shed loads, occasionally. So what? It's all about ensuring the best outcomes for students. Worth taking a bit of negative publicity for that, isn't it? You could call it the 'Luke effect', "Woe to you when all people speak well of you, for so their fathers did to the false prophets". (Luke 6:26). Multi-author works can often appear fragmented and lacking in coherence, which is fine if the book is a collection of essays exploring variations on a theme. Not so fine if the work is billed as an exposition and defence of a 'way'. I wasn't expecting expecting the conceptual clarity of the Definition of Chalcedon, but the title seemed to promise an orderly and systematic presentation of the Michaela 'creed' and doesn't quite deliver on that front. The book could have done with an introductory chapter that set out the 'Michaela Way' as an integrated educational vision. The following chapters could then have shown how aspects of the 'way' worked out in practice when it came to curriculum design, pedagogy, pupil discipline, and so on. As it was, I left the book a little puzzled as to where the 'Michaela Way' came from as an educational philosophy, its underlying presuppositions, and so on. That lacuna made the work seem more like a high grade how-to book than an attempt at offering a compelling and coherent educational vision. Despite these misgivings, I must admit that I found myself joining in with the Battle Hymn of the Tiger Teachers at many points. 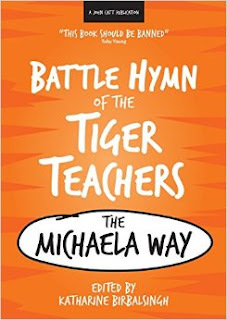 Even without the benefit of a 'vision thing' chapter, it is clear that the driving theme of the Michaela 'battle hymn' is that progressive education is bunk. Absolutely no truck is given to child centred learning, relativistic approaches to pupil behaviour, or pedagogy that places the acquiring of nebulous skills above that of solid knowledge. I must 'fess up' at this point and admit that most of what I know about pedagogy has been gleaned from bits and pieces I've come across on Twitter. But from what I've seen, an increasing body of research evidence seems to show that teacher led instruction is a more effective way of conveying knowledge and enabling mastery than pupil discovery-based models. (See here and here, for Nick Gibb on this). The chapters by Joe Kirby on Knowledge, Memory and Testing and Olivia Dyer on Drill and Didactic Teaching Work Best demonstrate how Michaela has drawn upon some of the latest research in developing its curriculum and in-house teaching style. It is arrant nonsense to say the advent of the internet means children no longer need to be taught stuff because now they can look it up on Wikipedia. Students of all backgrounds benefit hugely by being taught the best of what has been thought, said and done by teachers who are experts in their fields. Knowledge mastered and remembered is power. Aside from cultural empowerment, we also need to factor in the additional weight given to terminal exams in the new style GCSEs. A facility for Googling is of no help in the exam hall. I also appreciated Michaela's hard-edged approach to inclusion, where all students are expected to make excellent progress, whatever the disadvantages of their background or SEN issues. To suggest otherwise is to succumb to soft bigotry of low expectations. As is making allowances for bad behaviour on the part of some pupils. At Michaela all are required to work hard, be kind and cultivate an attitude of gratitude. Similarly, when as chair of governors I speak at parents' evenings I make it clear that we expect our students to be considerate, conscientious, and courteous - all of them, at all times. Rigorous and consistently applied systems need to be in place to ensure good behaviour is appropriately rewarded and bad sanctioned. Now for the theology bit. Aside from the 'hymn' reference in the title, the book is peppered with biblical allusions. Joe Kirby draws on 'the Matthew effect', citing Matthew 25:29. In the blurb on the back cover Michael Gove writes, ''This book is their testament and my gospel." But the 'Michaela Way' is not and does not purport to offer a Christian vision of education. Many aspects are certainly in harmony with the Christian faith such as the rejection of Rouseeau's Romantic view of children, the recognition of teachers as authority figures, and an emphasis on personal responsibility and discipline. Education at Michaela is seen as the pursuit of truth through acquiring knowledge and an exercise in character formation. Can't argue with any of that. But a distinctively Christian vision of education would flow from the realisation that, "the fear of the Lord is the beginning of wisdom". We come into our own as homo sapiens (wise people) by understanding ourselves and the world around us in relation to God. As the Reformer John Calvin put it, "Our wisdom, in so far as it ought to be deemed true and solid Wisdom, consists almost entirely of two parts: the knowledge of God and of ourselves." (Institutes of the Christian Religion 1:1:1). It is for Christian parents with the support of the church to provide their children with a God-centred vision of education. That holds true whether they homeschool, or send their children to schools in the private or state sectors. In Michaela's 'us against the world' dictum I discerned a faint echo of the words of Athanasius, champion of the orthodox doctrine of the Trinity in the fourth century AD. With the support of Roman emperor the heresy of Arianism had gained acceptance in the church. Athanasius was having none of it. People tried to browbeat him into submission saying, "Do you not realise the whole world is against you?" To which the church father is reputed to have replied, "Then Athanasius is against the world." His doggedness won the day and the church was restored to its confession of one God in three persons. A similar determined resilience will be required on the part of those who set themselves against the world of progressive ideas and practices that for far too long have held back educational outcomes in England. That said, the trad/prog divide shouldn't be absolutised. Traditionalism at its worst is incapable of embracing necessary reform. Progressivism at its worst refuses to learn from the wisdom of the past and is therefore doomed to keep on finding new ways of repeating old mistakes. An element of creative tension is needed between preserving the best of the past and rising to the challenges of the future. We should not romanticise the 'good old days'. I well remember being bored out of my tiny mind by lessons that comprised of little more than 'dictation', punctuated only by a pause by the teacher to chuck a board rubber at daydreaming pupil. Double physics with Mr. Whatshisname, complete with bow tie, winklepicker boots and a mission to put generations of children off the wonders of science for life. Who'd want to go back to that? Readers won't find everything in these pages to their tastes. The Michaela approach to pupil discipline can seem a tad harsh. I think performance related pay has its place in improving the quality of teaching and raising standards. Group work isn't all bad when carried out in lessons that are predominantly teacher led. If it is, how come many Russell Group Universities use it in their science and engineering courses? The quality of the chapters is uneven. Some writers are quite didactic in style, referencing scholarly studies. Others are more 'chatty' and anecdotal. The work is characterised by a defensive stance, adopted to fend off anticipated brickbats. Reflective self-criticism can be lacking. On occasion the pride contributors have in their school seems a little self-congratulatory. Such quibbles aside, Battle Hymn of the Tiger Teachers is a thought proving read that deserves serious attention from anyone who has an interest in the future of education. Does your vision for the school include a commitment to academic excellence and pupil character development? Is the curriculum sufficiently broad, enriching and rigorous, both in its vocational and academic elements? Or are some subjects taught simply to boost the school's standing in the Performance Tables, although they are of little benefit to students? (Like the discredited ECDL). Does the in-house style of teaching help ensure the mastery and memorisation of knowledge by students, with the result that rapid and sustained progress is made by all? Is this evidenced in internal data reports and exam results, for all types of pupil? Are systems of pupil behaviour and discipline implemented with rigour and consistency, leading to children being considerate, conscientious, and courteous at all times? Can this be seen when governors visit the school? What do student panels say? What do parent surveys say? What is attendance compared with the national average? What about exclusions? Are school leaders burdening teaching staff with excessive workload due to systems of data collection and work scrutiny? What do staff surveys say? To what extent is CPD aimed at deepening teachers' subject knowledge, as well as enhancing their skills? Do governors receive reports on the CPD programme and its impact? What do staff surveys tell you about the quality and effectiveness of CPD for all teaching staff from NQT to UPS? Is inclusion hard-edged, with the same high expectations concerning behaviour and academic progress for all pupils? How are governors monitoring this? Are all students making at least the expected progress, given their starting points? * I am grateful to the publishers for sending me this complimentary review copy.